Call (800) 843-4983 or click "Get Started" to speak to a strategist. Everything you need to take your wedding business to the next level. Automatically boost your SEO with a mobile-optimized, customizable portfolio that puts you everywhere couples are. Examples of your work show couples you have what it takes to bring their dream wedding to life. 84% of people rely on online reviews as much as personal recommendations. Show your best, first. Your headshot and bio give off positive vibes and let everyone know they can count on you to make their day a success. Communicate better and faster with chat-style messages that today’s couples love and expect. In fact, our entire wedding marketing platform makes it easy to engage with couples on the go. Get in on workshops and events where you’ll meet industry thought leaders, inspire other pros and learn how to position your business and book more weddings. 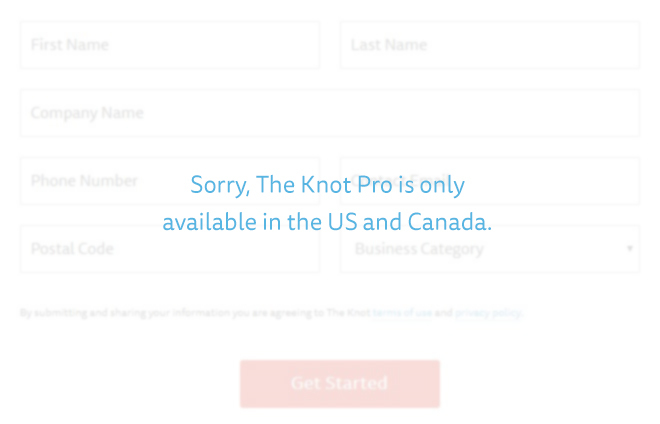 Each year, pros with the best reviews win The Knot Best of Weddings award. Make the cut and get even more exposure—and bragging rights. Get seen by more couples with a variety of premium placements on TheKnot.com, or take advantage of our email marketing and print advertising opportunities. Call (800) 843-4983 or send us your contact info and an Account Executive will reach out.